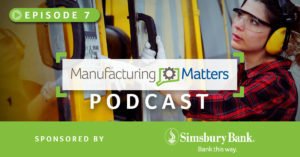 Simsbury Bank‘s Manufacturing Matters podcast spotlights how Stanley Black & Decker is leading the world with its brand of Manufacturing 4.0, a better way to build products. Simsbury Bank CEO & President Martin Geitz and Stanley Black & Decker Global Vice President Sudhi Bangalore reveal how solutions move from ideas to high-quality, manufactured products faster, more efficiently with lower costs. Listeners will learn how breakthroughs from Stanley’s new Advanced Manufacturing Center (opening in downtown Hartford in 2019) can be applied across the industry to help large, medium and small manufacturers and their supply-chain partners. It’s revolutionizing manufacturing and it’s happening right here in Connecticut. Be sure to listen, as Mr. Bangalore describes a significant issue for Connecticut Manufacturers, which centers around the huge skill gap that currently exists, with many manufacturing jobs going unfilled. The perception of manufacturing is dated. People don’t realize that there’s a lot of cool, exciting and creative manufacturing career opportunities. Stanley Black & Decker’s downtown Hartford Facility (opening in 2019) will be a critical resource that will help educators, parents and teens understand that manufacturing careers can be a wonderful career – clean, cool and creative.